The opening hours of Fire Emblem: Awakening can be harrowing. As with most role-playing games, your characters all start out pretty weak. It's a long road to mastery—you'll have to win many battles, earn enough money to afford better gear, and plunder treasure chests for rare spells before it starts to feel like your a-team is really The A-Team. What makes this process especially hairy in Fire Emblem is that if you screw up, death is forever. Fortunately, the game throws you a bone: a bone named Frederick. Frederick. Bro. I can say without any exaggeration that Chrom and I would have been lost without you, man. Seriously… in those opening hours, we would have actually lost. Like, lost the game. While the rest of my characters were low-level stooges who couldn't take down an enemy swordsman to save their lives, there you were, an already classed-up Great Knight, crushing everything you touched, usually in a single hit. Arrows bounced off of your armor, sword-swings whiffed time and again, evil wizards' spells caught only air. And then came your rebuttal: "Pick a god and pray!" If you've played Fire Emblem: Awakening, you probably know what I'm talking about. In the early goings of the game, Frederick is a one-man army. On normal difficulty, I would send him off to clear out an entire line of enemy troops, one after another. If someone had to go in first, it was always him: the enemy's turn would prove more ruinous than mine had been, as his army broke against Frederick like waves against the mighty cliffs of Dover. But of course, nothing lasts forever. One of the cool things about Fire Emblem is how over the course of the game, your weakest characters can often become your strongest. A thief that was once only good for hiding in the back and picking locks classes up to become a talented Trickster, dodging every attack and casting healing spells. A lowly Mage, at first so vulnerable to physical attack, climbs onto horseback and becomes a destructive Mage Knight. 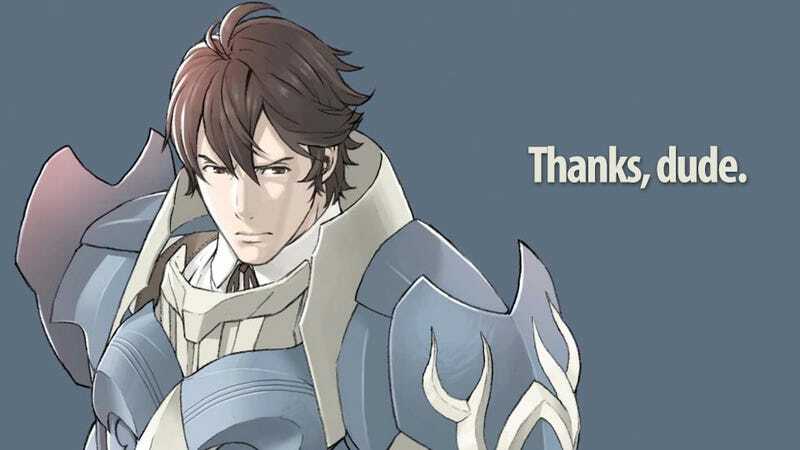 As your lowly characters become more powerful, so Frederick becomes comparatively less so. These days, he's maxed on experience, and he spends his time backing up his wife Cordelia as she climbs the ranks. Thanks to the fact that I'm waiting to class her up until level 20 (and she rides a flying horse), she'll probably end up being even more powerful than her noble husband. And so, after a long tour of duty, Frederick has been retired to support status. As he turns to ride away from the front line, he casts his eyes ever-so-slightly downward. His fate is uncertain. Could he eventually find himself out of the starting lineup? Could the Hero of Breakneck Pass wind up riding the bench? Surely not. He stops, turns, ready for duty as always.